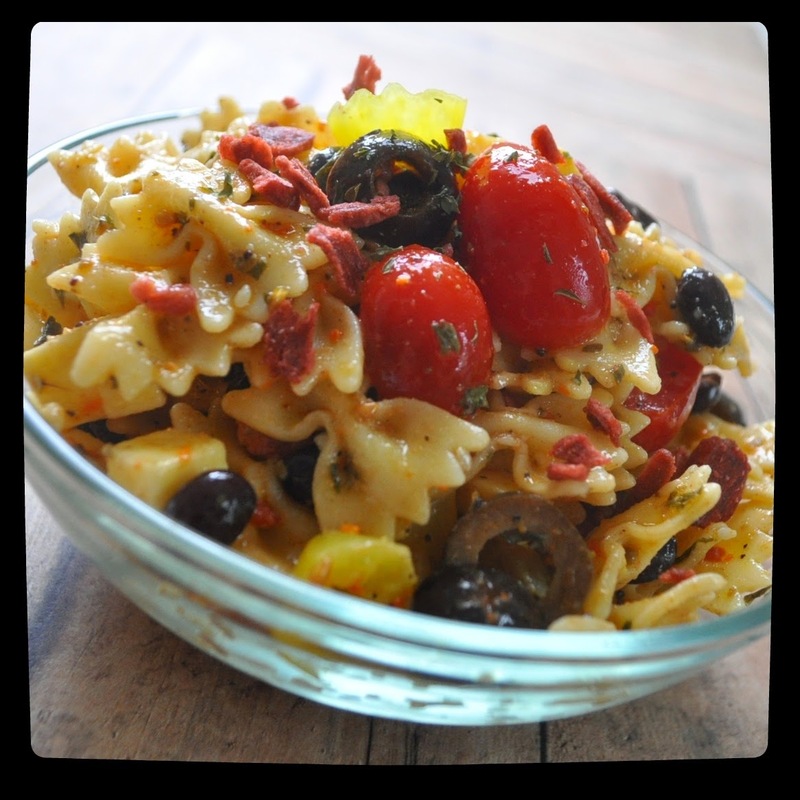 Recipe: Greek Pasta Salad | The Food Hussy! I grew up spending many many hours at First Church United in West Liberty, Iowa. Why? Because my Grandma served food at every event there for probably 20 years. That's how I grew up and how I was taught to serve and volunteer. Recently my church requested new folks to add to their service team - to bring food for the many funerals and services they hold. I jumped at the chance! I figure this will be a great chance for me to cook more - as well as serve where needed. In addition, it's a great way to remember my Grandma and what she taught me. It's also fun to be able to make new recipes and blog about them! I negotiated to bring a pasta salad and thought I'd just make a little extra so Larry and I had a bit to try. So I knew - it had to be egg-free. I found a great recipe for a Greek Vinaigrette and decided that would be my inspiration! I also was super-excited to try out my new pots & pans from Brylane Home!!! Finally - MATCHING POTS & PANS. I'm 41 years old and this is a first for me! I chose the purple color because it's so fun and the ceramic inside. I've tried a ceramic pan at a cooking class and loved it - so I was anxious to use them in my own kitchen as well. All I did for this recipe was boil pasta - but hey - you gotta start somewhere. These pans are lightweight but a nice quality. The other bonus is that the pasta pot handles fit nicely in my sink when filling the water. I could sort of rest them on the lip of the sink and gather ingredients while the water filled up the pot! I made the Greek Vinaigrette dressing first and let that chill and meld together while I prepped the pasta salad. This was a really easy recipe to put together. I actually had something else in mind but was too tired to go to the store - so I created this by just staring at my cupboard for a few minutes! The only real substitute I had to make was monterrey jack instead of feta - but it turned out great. I diced the jack into very small cubes. * The pasta salad absorbs a lot of the dressing overnight - I reserve some of the dressing to put on right before I serve to give it a little fresher feel. Otherwise it can soak it all up and then be a bit dry in the morning. * Add just half the bacon bits (or real bacon) before you chill and then half right before you serve. The first bacon will moisten up a bit and rehydrate while the ones you add at the end will provide a nice crunch! * I added black beans because they were in the fridge - a little extra protein. But you could easily substitute those baby pepperoni circles or some diced chicken if you wanted to make it a full meal. 2. Boil pasta according to package directions and drain. 4. Once pasta is drained and cooled a bit, add pepperocincis, cheese, olives, cherry tomatoes, 2 Tablespoons bacon bits and 1/2 Tablespoon McCormick Salad Supreme. Stir gently to mix. 5. Drizzle HALF of the Greek Vinaigrette dressing and mix well. 6. Place pasta salad in air tight container and refrigerate for 2 hours or overnight. 7. Right before serving, add in additional Salad Supreme and Greek Vinaigrette dressing. Stir well. 8. Top with remaining bacon bits. Disclosure: Brylane Home provided me the pots & pans free of charge but the opinions and recipe are all my own.